A full-size medieval broadsword has been in the trunk of our car for four months. It belongs to Christopher, our oldest son. We were asked to take it to him. But getting it there is not simple: Chris lives in Vernon, B.C., 1,878 kilometres away from where we live. Chris is not in the habit of collecting medieval weaponry. What he thought he was doing last June, when it came into his possession, was being a groomsman at his brother’s wedding. 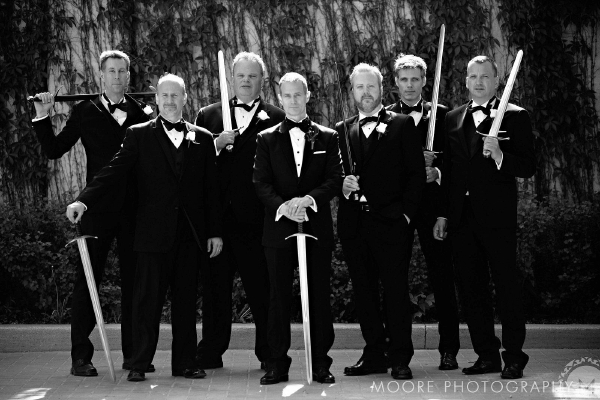 However, Troy – the groom – had a medieval theme at the wedding reception, and proceeded to give all his groomsmen genuine replica broadswords (see inset). Mercifully the things had not been sharpened. Of course, all of those groomsmen – except Chris – live here in Winnipeg, so when the wedding was over they took their swords and went home. Chris, however, had to return home by air. Which is exactly what Christopher said to me. Into my car went the sword, and off he flew. The sword stayed there – in the car’s trunk 1 – even when we drove that enormous distance in July and August to our cottage and to a number of cities in Eastern Canada. And, once we were back home in Winnipeg, an opportunity to go out to Vernon did not readily present itself. 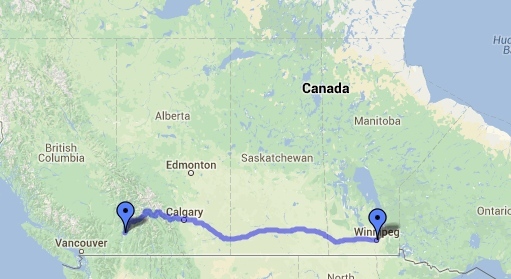 After all, this is not a simple junket: two days’ drive across the prairies will get you to Canada’s western mountain range, and another day is required (if the weather is good) to go through the mountain passes until you get to Vernon. November is not an auspicious time for “good” weather in Canada. The transition to winter has begun, and brings with it a mix of freeze and thaw, snow and rain, ice and fog. Driving could be really tricky. But, if we didn’t go soon, when could we go? We couldn’t go at Christmas – Rachael and Michael would be here. In the New Year we’re planning yet another 2 ocean cruise (this one to Hawaii). Then there’s Easter, and after that, in May, we’re off to California for Rachael and Michael’s wedding! We will see Chris and his family at that wedding, of course, but everyone will be travelling by air, so there will be no swords there, thank you! In short, if we don’t go in November, that thing will still be in our car a year after it was put there! Besides, we hadn’t been to Vernon for almost three years – so it was high time for a family visit. So, we decided to attempt the trip. We would start on November 12, and – given the possibility of unpredictable winter events – we would just have to get there when we got there, and get back when we got back; accomplishing the whole thing as safely and carefully as possible. 1. I’ve done serious winter driving before. I drove from Toronto to Winnipeg in December, 2004, through a blizzard, by myself, in an elderly and rusty car. I was careful, I took no chances, and I actually enjoyed it. 2. The entire distance for this journey is on Canada’s main coast-to-coast highway – a multi-lane, high-speed, often controlled-access route that is well-maintained and well-travelled. 3. Senior citizens like me don’t often drive such great distances in winter, but truckers do. Their huge vehicles help to keep lanes open (they blow the snow away as they pass). Besides, such trucks are easy to see; so you can get a sense of the road quite far ahead, just by watching the behaviour of the trucks. In the days before we left, I began to check weather reports frequently. Some snow was forecast for the mountain region, but there were no travel warnings. A key component of my travel plan 3 was to regularly notify a number of people about our progress. Two adult daughters of Werner and Mary Schulz, 4 live in Calgary, which is on our route. We thought we would try to visit the two young women, either on our way out or on our way home. I therefore set up a group text message that would update both the daughters and the parents about our journey as we went along. A similar group message was set up for Christopher and his family – so that they could get a sense of when we might arrive. Troy and his family were included in that second group – being our “anchors” here in Winnipeg – since they might want to know when (and if) we would be getting home. Rachael was added as well, mainly because, although she doesn’t live anywhere near our intended route, she was interested. All in all, at least nine people were about to get regular updates, any of whom might raise the alarm if those updates were to stop unexpectedly. We packed for winter emergencies: candles, blankets, high-energy food bars, flashlights, heavy parkas, boots and mittens – all sensible things to have in one’s car, should it become disabled in the freezing cold. The sword didn’t need packing. It was already in the trunk. It was bright and sunny as we set out. The highway was clear, and visibility excellent. Heather and I really enjoy driving long distances together. We talk easily, about all sorts of important things, and we exult over the spectacular scenery that Canada has to offer. We offered a prayer together – as we generally do at the beginning of long trips. Some people don’t like making the journey across the Canadian prairies, but we love it. The land is absolutely flat as far as the eye can see. It’s rather like being in the middle of an ocean – in a dead calm – where you can actually see the curvature of the earth! What dominates is not the surface on which you move, but the infinite sky with its varying patterns of cloud and blue. In the warmer months you can also see the occasional farmer piloting one of his huge machines across vast flat tracts of land, planting or fertilizing or harvesting; but by November all agriculture is done, and one can go for hours without seeing a soul, except of course for the few trucks and other vehicles travelling the highway. My natural speed is slightly faster than that of the big commercial trucks. I would see one far down the road, tiny, almost like a toy, then getting larger and larger in the five or so minutes that it takes me to catch up with it, until the thing is rumbling along, huge beside my little car, as I pass: a tractor pulling one or two great boxes on wheels, or perhaps hauling tank containers, full of something flammable. That beautiful first day passed quite quickly. In the early afternoon I reached for my cellphone. We now were certain that we could make it to the city of Swift Current, Saskatchewan, so it was time to book our first night’s accommodation. “Give me that!” said my lovely wife, in a voice that was neither lovely nor friendly. “Here,” I said, and handed the phone to her. The trouble is, we were not about to make a phone call. Instead, we would be using the phone’s Internet software in order to select, and book, and pay for a motel. This would be followed by the sound of a finger poking at the device, and a few muttered words of an unpleasant nature. We draw the curtain over the next several minutes as I try to give verbal instructions without seeing what she has on the screen. But we succeed, and soon a hotel has been booked from the comfort of our car. A few hours more and we were snugly settled in for the night. We had covered 815 kilometres in our first day on the road. The next day had great travel conditions, too. Calgary is about four hours from Swift Current, but just when we were trying to reach our friends there, the battery on the cellphone died. Apparently it had not been charging properly overnight. Luckily, before it had collapsed entirely, we managed to set up a quick rendezvous with Maika Schulz – one of the two visits we had hoped to make in Calgary – at her work. Without the phone’s electronic mapping system to guide us, it took a little guesswork to find the place, but we were successful, and had a great visit. As a bonus, a shop right next to Maika’s workplace was able to sell us a good in-car cellphone recharger! I was not going to run out of people-contacting power, or map power, again, especially since we were about to enter the most uncertain part of our journey! In this silent solemn world, winter had definitely arrived. We drove out of Calgary and into the Rocky Mountain foothills. Words cannot describe the overwhelming majesty of the mountains as the road wound its way toward them. Jagged peaks cut the sky, treeless, impossibly steep, and thick with snow. Most of them are snow-capped all year long, but as we drew nearer it was obvious that winter was no longer limited to the greatest heights. Snow now covered all of the barren rock above the treeline, and the trees themselves, lower down, were blanketed in white. In this silent solemn world, winter had definitely arrived. All the same, the road itself was still free of ice and snow, and we sped along, exulting in the astonishing scenery. But evening was approaching, and we decided that we should stop for the night in Canmore, Alberta, a tourist and skiing town not too far into the mountains. Out came the smartphone once more. Heather was now more proficient at booking motels from a cellphone, and we were soon assured of a safe and warm place to spend the night. However, it was quite dark when we got to the town, and we couldn’t find our motel at first. Canmore must have a policy not to scar the mountain nights with bright electric advertising, because stores, restaurants and hotels all seem to have plain wooden signs, with the business name either painted or carved, and difficult to see in the dark. But with the phone’s mapping and locating system to guide us, we eventually found the place that Heather had selected. It proved to be almost luxurious, and yet not at all expensive. Prices probably go up once the skiing season has started in earnest. In the morning, before leaving Canmore, we stopped at a coffee and donut shop in order to fill our thermos. There were a couple of police officers outside the shop, standing by their vehicle, so I approached them. The transition to winter driving was immediate. Ice and snow covered the highway, and for the rest of this adventure we did not see many snow-free highway surfaces. Snow also obscured the edges of the road. On curves there was always the chance that we could lose traction, and slide over the edge. Visibility dropped, too, as the road went higher and higher into the pass, and we went through squalls of falling snow, or patches of thick fog (essentially, clouds clinging to the mountains). The highway itself is an extraordinary work of engineering. Four lanes wide in many places, it flows gracefully along mountainsides and through deep valleys. Heather and I frequently marvelled, thinking of the first explorers riding or leading horses through this terrain, either following riverbeds or inching up through forests where the footing is always at some impossibly steep angle. With snow and ice on the road surface I drove at much less than the stated speed limit, but still, by comparison with those early explorers I was flying swiftly through this inhospitable land. Now and then there would be a break in the clouds, and we could see the mountains high above us, majestic in the sun. Our hearts would leap at the beauty of it all, but only for a second or two: I could never take my eyes off the road for very long. There were other vehicles on the road, of course. This is Canada’s primary route from prairie to ocean, so there were several commercial trucks and the occasional private vehicle like ours. Most of the time we all kept the same pace, but occasionally there would be a car with a very timid driver, or a truck so heavy that on long ascents it would be reduced to a crawl, and I felt that I should try to pass. This action needed to be planned carefully. One wouldn’t want to be passing on a curve, lest all traction be lost and something awful ensue. As well, the fairly regular traffic tended to blow the snow off one lane, exposing enough pavement that our tires could grip reasonably well. But the “passing” lane was mostly snow and ice. So, if I chose to pass someone, I would have to move into this much more treacherous lane (churning up a spatter of snow in the process), then keep my line until the pass was completed (muttering an apology to the slower driver when slush and snow from my wheels flew up onto their windshield). Both Heather and I held our breath throughout this procedure. Occasionally vehicles even faster than ours would roar by, serving us with a spattering of road snow. Generally these were four-wheel drive trucks with someone young and confident at the wheel. Overconfident? Perhaps. I wished them well. Once, we caught up with three highway transports ahead of us, two of them moving quite slowly. The third pulled out to pass. I am told that when one heavy truck attempts to pass another and both are near to their maximum speed, drivers call it an “elephant race,” because the overtaking process takes a very long time. But here, that was not the case. The passing truck showed itself to be quite nimble, and once the pass was completed it moved ahead at a speed that I would have chosen for myself. “That’s gonna be my truck!” I exclaimed, meaning that, if I could, I would fall in behind it and use it as my guide through the snow and the fog. So I moved into the passing lane, slipping a bit and scattering snow, and soon was pulling alongside the slower freighters. As I did so, however, the road began to curve again, and the chance of me sliding sideways off my lane, across the median and into the oncoming traffic became alarmingly high. So I slowed, until the motion of the truck beside me, and my little car, resembled the “elephant race,” except that one of the elephants was very very small, compared to the one beside it. Then the road straightened out and I increased speed, until I had moved well ahead of the two heavy transports, and back into the better, more grippy lane. There followed a short period of rather too-fast driving, and then I had my “guide,” exactly where I wanted him, about six car-lengths ahead. When his brake lights went on, I stepped on the brakes. If he increased speed, so did I. If he passed another vehicle, so did I – carefully – taking no chances. And by watching him I could see curves and sharp turns long before they were upon me, even in thickly falling snow. From then on, driving became a much less nerve-wracking experience; and we kept our “guide” until we came down into the mild and fertile Okanagan valley, where we left the main highway and drove south toward the city of Vernon. In this valley, although there was snow on the ground, and some on the road, the sun was shining, the air was definitely warmer, and the roads much easier to negotiate. Eventually we came to Vernon. A text-message to Christopher determined that no one was yet at home, so we stopped at a carwash, and sluiced away the slush and salt and ice that had accumulated on the car. In due course our shiny, and almost new-looking vehicle pulled into Christopher’s driveway. Chris himself arrived moments later. I won’t dwell for long on the family visit itself. It was just wonderful to be there, and we were made very welcome. We tried to be helpful grandparents, going on errands, helping with meals, and on at least one of the evenings we took son, daughter-in-law and granddaughter out to a nice restaurant. Of course we were intruding on their normal, very busy, lives: Chris, immersed in the work of a large church; Andrea, his wife, back in university, studying hard and writing essays; and Alexa, their daughter, in her last year of high school. Our grandson, Matt, is already living away from home, far to the North in Fort St. John, where the energy industry has lots of jobs for young men willing to work. Chris and I would stay up late into the night, just talking, father and son. Sometimes, since we are both Anglican priests, we would “talk shop;” but more often we would discuss family, current events, or Chris’ interest in comedy. 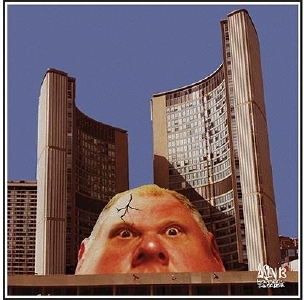 Our visit took place during the height of the media frenzy surrounding Rob Ford, mayor of Toronto. Ford’s actions, and the media coverage of them, bizarrely combined both current events and comedy, and we enjoyed ourselves hugely. As it happens our visit to Vernon also coincided with something rather unique taking place at Chris’ church: a musical concert in which he himself was performing. The concert wasn’t even a “church” event; it could as easily have taken place in a theatre or concert-hall. The two organizers just happened to be Vernon church leaders, and Chris’ church had suitable space, so that’s what ended up being the venue. The evening featured a Canadian jazz pianist, Mike Janzen, and a warm-up act by Karen Wiseman, an amateur jazz singer who is also a member of Chris’ worship music group. Chris played bass, both with Wiseman, and with Janzen. The music was excellent and of the highest quality. Heather and I enjoyed every minute of it. But I can’t resist telling you about one hilarious moment: in a segment featuring jazzed-up versions of some kid-friendly tunes, Mike Janzen said, “I’m dedicating the next number to Mayor Rob Ford of Toronto.” As he started to play the first notes of “If I only had a brain,” 5 it brought the house down. Good times and laughter and happiness don’t always make for interesting stories, do they? Our time in Vernon was all of that, and more, so let’s just skip right along to the frightening stuff. Because, of course, we were almost 1,900 kilometres from home, the weather throughout Canada was getting much more wintery, 6 and there was only one way back: through those high and snowy mountain passes. But, our family has a saying, “After three days, relatives and fish begin to smell.” In other words, a short visit is more fun and leaves better memories than a long one. Besides, if we were to stay longer, when would highway conditions improve? After all, this was mid-November, the very beginning of winter! If I were to let hazardous road conditions deter me, we’d be staying in Vernon until April. And that wouldn’t be pretty... for any of us. The journey home began just after noon on Monday, November 18 – pretty late in the day to start such a long journey. I suspect the delay was a subconscious reluctance and fear about what lay ahead. And this delay meant that there were only four hours left for driving in daylight. Even in good weather on normal terrain I prefer not to drive after dark; but in winter? through mountains? in snow and rain? I’d be a fool. Still, I figured that we could make it across Rogers Pass, the first of two serious mountain passes, and get to the town of Golden, B.C. by nightfall. It was overcast as we set out, then it began to rain. As the road climbed into the mountains, rain turned to snow. The road surface became slushy, then slushy with ice. Then just snow. And fog. Glancing in the rearview mirror, I saw a large moving van following me at some distance. Over the next ten or fifteen minutes it grew closer – obviously going just slightly faster than I was. Phoooof!!! Its sixteen wheels and great height kicked up so much snow that I couldn't see a thing! Where’s the edge of the road? Where’s the centre line? Most important, where’s that truck? What if it had also slowed? I would run right into the back of it! I reduced speed until we were almost creeping along. Then the air cleared, and I spotted the moving van more than 500 metres ahead, still kicking up great clouds of snow. Obviously, it would not be a good plan to use that truck as a “guide” today! Suddenly I could see flashing red lights, and there before us was a cluster of emergency vehicles. An enormous semi-trailer was overturned. Clearly the thing had tipped when rounding the curve and slid catastrophically, ploughing into concrete barriers on the median and scattering them like nine-pins. The whole thing had then snapped in two, and come to rest on its side. It is possible that the driver lived, but not certain. Although the moving van ahead of me had never shown any sign of reckless driving, once we passed that accident, I sensed a distinct increase of caution in its negotiation of the highway. But we made it to the town of Golden, and settled down for the evening in a little nondescript motel. Once I got online in our room, I scoured media sites for news of the overturned transport truck, and not finding any, I began to have some hope that the unfortunate driver had lived. If he did, though, he will probably have nightmares about that accident for a long time. When you plan a winter driving trip, take a snow-brush! In the morning, we looked out the window of our motel, and saw a world buried in snow. There were ten or twelve centimetres of the stuff on our car, sitting in great lumps on all the surfaces. It looked like a series of hats – a tall one on the car’s roof, and little ones on the exterior side mirrors. In preparing for this trip we had thought about car failure in extreme cold. From energy bars to blankets, we had packed for low temperatures. But we had forgotten about snow. Where was our shovel, in case we got stuck in drifts? And... where was our snow brush and ice-scraper? Forgotten. Well, there was nothing for it but to brush the snow off with our hands, and then, when underneath the snow we discovered ice on the windows – Heather attacked that with the straight edge of a plastic toothbrush container! It did the trick, more or less. Running the engine until the interior warmed up finished the job. We drove out of the town centre and up toward the highway, with snow falling heavily. 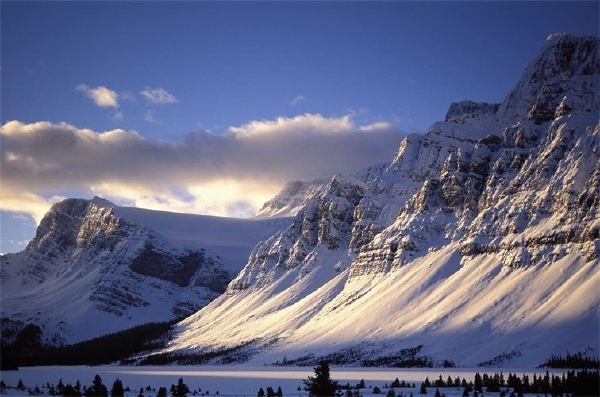 What, we wondered, would await us in the most precipitous and dangerous pass in all of Canada? There was a place to get breakfast on the highway – we had driven by it the night before – and although it meant retracing our route briefly, we decided to go there. On our way, we came upon some police in high-visibility vests. They were stopping the traffic that was coming toward us – traffic headed in the direction that we ourselves would be going after breakfast: up the Kicking Horse Pass. This good-humoured quip calmed me completely. So, after breakfast we set out towards the pass, waving to the police as we went by. Up and up we went, windshield wipers pushing away the snow as it fell. I have been this way several times, and knew what I would see if there had been much visibility: a 500 metre drop on my right into the canyon far below, and on my left a cliffside, towering overhead, covered in steel mesh. The mesh keeps falling rocks from dropping onto the road surface and onto vehicles. Rock does fall, but it stays behind the mesh and rolls into a deep ditch. Up, and up, around sharp curves left and right. Sometimes I felt the car’s wheels spin on the icy surface. Then, rounding another curve, we saw a car on its side, wrecked, deep in the ditch under the cliff. If it had gone over on the other side of the highway it would have dropped straight to the canyon floor. The occupants were out of the car – they must have climbed through the upward-facing door. They stood, huddled together in the snow, lighting one another’s cigarettes. Several transports and a couple of pickups had stopped – I saw people talking into cellphones, so help was being summoned. We crept by and carried on through the pass, often at 60km/h, eventually making it to Calgary. The heavy snowfall never abated. In Calgary we were able to stop for coffee and a delightful visit with Meaghan Schulz – the other young woman we had hoped to see on our trip. And, by the time we got back in the car, the sun had come out and was shining brightly! We returned to the highway in high spirits and motored along happily for quite a while. But before long, we found ourselves once more in a snowstorm. Darkness; snow; bright flakes gleaming in our headlights; uncertainty about where the edge of the road is. Occasional traffic coming the other way and kicking up thick clouds of snow. Our wheels bounce over small snowdrifts on the pavement. What might suddenly loom up out of the darkness? Is this blinding snow churned up by a truck, unseen ahead of us? ... or is it just what’s coming down from the sky? Even a turn in the highway, invisible under the white snow, could cause us to ditch the car. The headlights of the occasional oncoming vehicle, at least tell us whether the road ahead is straight or curved. If only we could stop for the night! But there is no city or town in which to find a hotel. Nothing but vast black emptiness, through which we move, headlights doing nothing but light up a billion snowflakes. And Heather deserves extra sympathy, because as passenger, she is as focussed as I am on the road ahead, but if she spots anything hazardous she is completely helpless. Her life is in my hands. “Curve left ahead,” she says; having spotted a sign beside the highway, dim in the flying snow. “Thanks,” I reply. She gets to work, efficient now. The car moves along silently for another twenty minutes, then a lit intersection; a few buildings near the road; a gas station. Not long afterwards we arrive in the smallish city of Medicine Hat, and pull up to our motel. The next day dawned bright and sunny. The snow squall that had caused so much grief the night before had moved East, leaving behind a sharp drop in temperature and clear blue skies. Once more our car had “hats” of snow. I kicked myself for neglecting to buy a snow brush in Golden, or in Calgary. But the front desk clerk of our motel had one ready to lend me (I guess they’re used to guests like us), and I quickly brushed the stuff away. We loaded up, got some breakfast in a nearby restaurant, and hit the highway once again. This turned out to be the good kind of winter driving. There was packed snow on the “passing lane” of the highway, but very little on the normal lane, where traction was almost as good as in summer. The car flew over the kilometres, out of Alberta and into Saskatchewan, with the bright sun overhead, and what felt like infinite visibility. I was marvelling at how far ahead I could see. At certain points, I would select an object in the distance – a highway sign, perhaps – and try to guess how many kilometres away it might be. Could it be four? Five? Even six? I watched the numbers on the car’s odometer, and marvelled when I passed six kilometres and still had not drawn near to the object. One solitary tree turned out to be nine kilometres from where I had first spotted it! That is an extraordinary distance to be able to see from a moving vehicle. Yes, you can see much farther if you’re in an aircraft, but on the ground? Phenomenal. I finally realized what was happening: as we drive from West to East across the prairies we are slowly but continually descending. After all, we are moving from the Rocky Mountains to a much lower part of the continent. So, although the vistas are quite remarkable when driving the prairies in any direction, facing East you are actually scanning the world from a higher point, and can see... well, forever! We made excellent time. Sometimes I would venture on to the snow-covered “passing lane” to pass trucks and other vehicles, kicking up dense clouds of snow in the process. No doubt some drivers cursed me. Still, ours wasn’t the fastest vehicle on the highway, and occasionally another car would roar by, enveloping us in an instant “whiteout,” but for the most part we motored happily along and enjoyed the fabulous vistas. But by afternoon, on the horizon ahead we could see darkness. Was it the beginning of the evening? Days are very short in November, but although nightfall was approaching, the wall of darkness that we saw included the same snowy weather system that had so affected our journey over the past two days. Apparently we were catching up to it again as it moved slowly eastwards. My heart sank, because we were still at least 400 kilometers from home, and I could not conceive of covering such a distance at night, in a snowstorm. And sure enough as the sun went down, we found ourselves in heavy snow once more. We were nearing the town of Moosomin, Saskatchewan, and although the cellphone did not indicate the availability of any hotels, we entered the town and found one with a very welcome “Vacancy” sign flashing in the darkness. And so we had to spend one more night on the road, but we were safe, and warm. Before settling down, I went over to a gas station and bought a snow brush/scraper. Just as it had in Medicine Hat, the snow blew itself out overnight and the morning dawned bright, sunny, clear, and cold. We brushed off the car, found a restaurant for breakfast, and headed out on the last leg of our trip in the crisp winter air. Traces of the snowstorm were evident everywhere as we covered the last five hours of our journey home. Snowplows were on the highway; people were shovelling off the steps of their homes; pickup trucks with plow attachments pushed snow from entrances to gas stations and grocery stores. Winnipeg itself had been hit with the first blast of serious winter. But by mid afternoon and in good daylight we arrived at our apartment block and pulled into our heated underground garage. It is good to be home. But despite all the sometimes frightening adventure, we’re very glad that we went. You may of course have been waiting to learn whether, when we unpacked the car from the trip, we might uncover that medieval sword still deep in the trunk of the car. Well, we didn’t. It had been duly delivered, and although it was the purpose of the trip, it was hardly the visit’s focal point. The one amusing thing was that our two grandchildren – not their father who is its rightful owner – are competing with one another for possession of the sword. It is magnificent after all, and what a conversation piece it would be for either of these young adults to have on their wall! 1 The “boot,” if you’re in the U.K.
2 For a list of the cruises we have done, click here. 3 Speaking of “travel plan,” a map of the trip is available, complete with indicators of where the most notable events happened. Click on the map image, above. 4 Werner and Mary are our good friends with whom we have gone on two ocean cruises. See particularly the opening paragraphs of the narrative of our trip to South America. 5 The Scarecrow’s song from Wizard of Oz. 6 This was the beginning of one of the most serious winters North America has experienced in many a year.